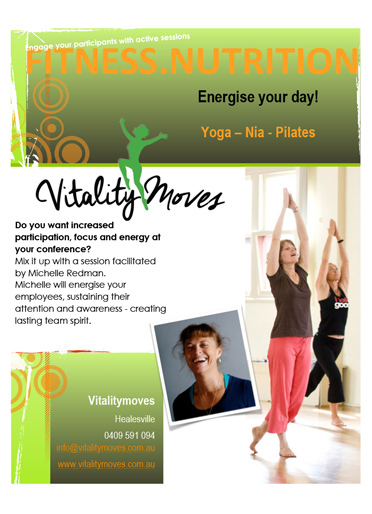 Vitalitymoves can provide that extra something for your conference in the Yarra Valley. We provide various options from Yoga, Qigong, meditation, Pilates and nutrition for the office, or something new like Nia. How about blending the energies of Nia (Yoga, Tai Chi and Martial Arts) with Pilates and or Yoga for a stretch with breath and vitality? A session that is energising and playful yet supports people and sustains their attention, focus and productivity throughout the conference day. Michelle specialises in presenting a body of work relating to well being in the work environment. This includes movement for neck, shoulders and lower back as well as nutrition. She will blend her skills to meet your needs, whether an hour session, an every morning to get you going session or a half day filled with action. Michelle demonstrates a Qigong sequence designed especially for the workplace, so that it is simple and easy to remember. The aim is for groups to learn it together and then suggest to each other to DO IT! Do it together at the start of the day, at lunch or in breaks. Doing it together, you support each other in creating a healthier workplace environment, decreasing stress and muscle tightness in the neck, shoulders and back. Thank you so much for joining us today and being such a wonderful part of our training day. What a great way to end the day! I speak on behalf of all our team in letting you know how much we all really enjoyed taking part in your program, even those of us who aren’t that co-ordinated. We will certainly be practicing all we have learnt and looking out for each other. Your energy and vibe are fabulous!!! Thanks for your inspiration – we are all discussing and moving today! You have a wonderful way of communicating, that is non-threatening, that helps people make changes in their life, your talk certainly helped some of us here! I would like to thank Michelle Redman for the meditation and relaxation techniques she taught the Property Management Team from Marshall White Real Estate at our last conference. It provided a wonderful range of tools to help manage stress, keep calm and enjoy life more. Before, life rushed past in a blur. I now know how to be still. Keep breathing! Download this pdf to give you some examples of our services.